Another great episode of Mixology Monday. Thanks to everyone for their posts. There were a lot of interesting ideas that I would have never even considered. And lots of cool pictures. I'm looking forward to a lot of expirimentation with all of the great recipes from this event. Send me an e-mail if I forgot you. I'm still expecting a few posts, and I'll update this list when they arrive. Here's the rundown of what I received, in no particular order. Paul over at Cocktail Chronicles was so taken with the apéritif theme he ran off to Italy to research Vermouth at the source. That is dedication. He came back with three classic drinks that put the vermouth at center stage. Robert "DrinkBoy" Hess didn't even know he was participating in MixMo. But if you post an apéritif cocktail on the same day as Mixology Monday: Apéritif, you're in! 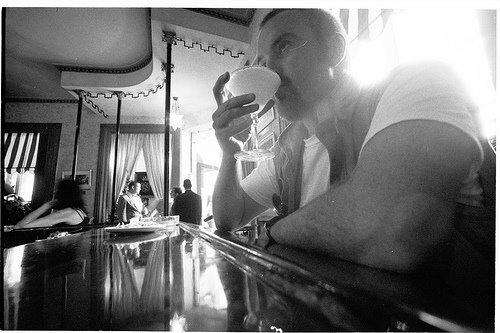 Robert posted about the Bijou cocktail over at The Spirit World. Chartreuse and sweet vermouth, sign me up. Meeta Albrecht's post at What's for Lunch Honey? features the "Upton Apéritif." This cocktail features rum and pineapple. It sounds really good and Meeta's photos are gorgeous so be sure to check out this cocktail and spend a while looking through the photos. Awesome. A double-barrelled effort! Michael and Jen really pushed out the boat with some great apéritif - food pairings over at adashofbitters and Gastronome. Seelbach, Cynar, Adonis, Artichokes, figs... Great! 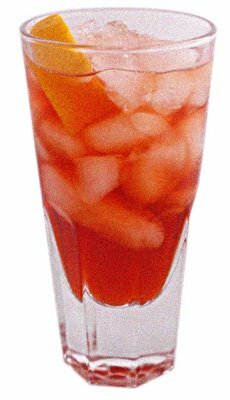 Barbie2be has posted a recipe and a picture of of delicious-looking Champagne/Pernod combo called the Pernod Pom Royale. Pernod and champagne definitely fit the theme perfectly. Haalo over at Cook (almost) anything at least once is using the wonderful Campari to mix up a Negroni. The proportions are unique, and it's a recipe I'm going to try. Haalo takes really great photos too, and you can spend hours browsing through the flickr collection. Gabriella True, the reluctant housewife features Poire William and Framboise. The photo of the Poivre Framboise Apéritif is very inviting indeed. Macky Lovina's post focuses on apéritif as an event and features Spanish Cava as a perfect party-starter. Ed Charles explores Aperol and the Pink Grapefruit Double Agent. Extra credit for trying an amaro that wasn't Campari. Darcy at theartofdrink has invented a drink that no one has ever tried before, and made it for the first time. From the sound of it he also made the last one ever. Jonathan Arnold at Jiggle the Handle meets la Fee Verte and tries a pineapple mint margarita from MMIII:mint. My post about the camparinete is here. Don't forget, Mixology Monday V takes place at Jiggle the Handle on July 17th. The subject is Lemon and I'm really looking forward to it.